Its scientific name, Atya Gabonensis also know as the Vampire Shrimp, or the common names, Gabon Shrimp, African Giant Shrimp, Blue Rhino Shrimp, etc. Vampire Shrimp is the most popular thing to call them. It is a bit misleading, as the Vampire Shrimp is, in fact, a very peaceable creature. It is also visually stunning and comes in several different hues, including the more subtle gray and brown varieties, and the more striking pink, blue or white varieties. Their appearance is enhanced further by the unique fanning movements that they make. The Vampire Shrimp possesses a delicate beauty. The Vampire Shrimp lives up to 5 years on average, when given the proper care (a respectable age for so small an animal). Following specifications is particularly important with the Vampire Shrimp, as it is a fragile creature as well as a picky eater. If you are serious about prolonging the lifespan of your Vampire Shrimp, providing it with its ideal conditions is critical. The Vampire Shrimp is typically around 1-3 inches at purchase. As it reaches maturity, it will grow to 5-6 inches. This is extremely large for a shrimp, which is doubtlessly what earned it the name African Giant Shrimp. Its longevity and great size make it one of the most desirable shrimp for pets out there. Unfortunately for enthusiasts, the Vampire Shrimp is rather rare. Some pet shops will not have them. You can work around this by making a special order request at a given shop. You can also search online. While some prefer to pick their specimens in person, you are sure to find a greater variety online. While you are at it, consider purchasing some companions for your Vampire Shrimp. The Bamboo shrimp is a fantastic choice, being one of the Vampire Shrimp’s favorite tank mates. The Vampire Shrimp is known to swim alongside the Bamboo Shrimp sociably. Though it does have an especial liking for Bamboo Shrimp and other shrimp, the Vampire Shrimp is not choosy when it comes to company. Indeed, thanks to its girth, among most fish it is not at risk. This being said, the Vampire Shrimp is quite shy, and prefer their space, so it is most considerate to pair them with creatures not known to be overly sociable, or, as the Vampire Shrimp would see it, nosy! Some compatible options are Singapore Wood Shrimp, Japanese Marsh Shrimp, and Cherry Shrimp. The Vampire Shrimp also gets along fine with Guppies, Cherry Barbs and the like. Of course, with all of these, ensure your Vampire Shrimp eats sufficiently. While the Vampire Shrimp is large and armored, and safe from most of the dangers more vulnerable shrimp face, there are unfortunately exceptions! Carnivorous catfish and crayfish will attack the Vampire Shrimp, as will small and large cichlids. Elephant-nosed Morymids and Butterflyfish are some great alternatives; in fact, the Vampire Shrimp should not even have to compete for food among these tank mates, ideally. A note: some fish medicines are poisonous to the Vampire Shrimp, as they commonly contain ammonia, copper and other chemicals that they cannot tolerate. Be aware of what exactly you put (or do not put) in the tank. The Vampire Shrimp is native to the freshwaters of West Africa and South America. Its name can be misleading, as the Vampire Shrimp is, in fact, a docile creature. “Vampire” must instead refer to its “demonic” appearance: it has a somewhat menacing, pointed shape and an outer shell that is hard and bumpy. In reality, the Vampire Shrimp is non-aggressive. The shrimp will even let plants in a tank be. Instead, the Vampire Shrimp only eats shed plant matter and other fine foods, and microorganisms. The Vampire Shrimp changes colors and can do so as many as a few times annually. It can make subtle shifts like light brown to dark, or even change to a mottled blue or pink. This can be fun to note. Even red and yellow specimens are known to show up, though they are comparatively rare. If you can find one at a local pet shop, you may want to snag it before anybody else does! Otherwise, you may be able to find one in these remarkable shades online. The “fans” of the Vampire Shrimp refer to its two front appendages. These are lined with plume-like bristles. The fans start moving as soon as food appears, and the Vampire Shrimp uses them to pull the bits into its mouth. You can see pieces stick to the bristles if you watch closely. You see, as touched on earlier, the Vampire Shrimp is relatively shy. It does not love attention or touch. Luckily the Vampire Shrimp does not appear to notice people looking in the tank. This can be taken advantage of to grant you the best views. Simply set up some caves with backs against the glass or something that will work similarly. From here, you may watch the Vampire Shrimp, with its intricate array of colors, sleeping and grazing serenely. Try not to have any rough or jagged decor included in your tank, as the Vampire Shrimp has some fragile parts (most notably the fans). This being said, your Vampire Shrimp will be very grateful for the proper decorations! Things with holes and tunnels and shadows to hide in are its favorite. It will also sift happily through the substrate, provided it is an excellent variety (courser substrate can hurt the fans of the Vampire Shrimp if it tries to filter the over-large granules). The Vampire Shrimp seems to be okay with sand, too. Make sure that you have your tank set up the way you like it before introducing your Vampire Shrimp. This is because, once your Vampire Shrimp has chosen a spot, it will consider it their home, and if the spot is moved or messed with from there, it will move to somewhere with “more privacy.” This does not happen right away, however. When its home is disturbed, the Vampire Shrimp will become distressed and disoriented; if it is moved, the Vampire Shrimp will have a hard time finding its way back. Once it does, it may no longer recognize the place as its own. It is best to avoid this for your Vampire Shrimp’s sake. The Vampire Shrimp is less likely to be seen moving about during the day. It prefers its retreats and will move about and feed more once it is dark. A night light specifically for fish tanks can allow the Vampire Shrimp to be viewed during these more active hours. As mentioned above, the Vampire Shrimp eats shed plant matter and fine foods in general, as well microorganisms. They use fans to stir up and consume detritus. This in mind, they are not fond of water that is too clean, though it must still be high quality. The Ammonia and nitrites should be at 0 constantly, and the nitrates should be kept at under 20. This can be achieved by doing the necessary water changes regularly. It is also best to have strong water flow to assist the Vampire Shrimp with feeding and the like. To mimic its natural diet, it is ideal to feed the Vampire Shrimp a mix. To begin with, squeeze the filter sponge into the tank. This sounds crazy, but the Vampire Shrimp loves to feed on the resulting gunk. Give it algae tabs as well. Algae of this sort are also often considered a nuisance, but the Vampire Shrimp is a huge fan. Baby shrimp food is another suitable choice, as well as other tiny foods for shrimp specifically. Release the food near your Vampire Shrimp, and it will feast on the bits until they are gone. It is essential to make sure that the Vampire Shrimp gets enough to eat when they share a tank with other fish. Fish tend to be the faster eaters and can leave the Vampire Shrimp hungry. To avoid this, feed your Vampire Shrimp once it is dark. Other fish will be less interested in feeding at this time. You can also opt to pair your Vampire Shrimp with fish that will feed in mid to top tank. This will leave the bottom feeder more territory. A true homebody, the Vampire Shrimp, loathes leaving its house (the nook or cranny it likes most). They do not go seeking food so much as wait for it to float by. So, when feeding the Vampire Shrimp, it is wise to release the meal close to the Vampire Shrimp, or, better yet, you can use a syringe to place liquid food directly, and carefully, into its home. In summation, the Vampire Shrimp requires water with a decent current, of a high quality, at a reasonably warm temperature (74-88 F); a combination of algae, the staple of its diet, as well as shrimp-safe meats (flakes, slurries, etc. ); and a fine substrate or sand (in fact, the Vampire Shrimp has shown noticeable discomfort on tank bottom of glass only. They like material to filter through, and it makes them more comfortable) along with plenty of nooks and crannies, like holes, caves and the like. The water of the Vampire Shrimp should also be highly oxygenated, as this is what they are accustomed to in nature. A 10-gallon tank will hold 4-5 Vampire Shrimp comfortably. Take extra care that the top of the tank is well-covered, as the Vampire Shrimp may wish to explore. A Vampire Shrimp will climb about where it pleases, basically, including filters and heaters. Therefore, it is best to take that little extra step to avoid possible harm. Remember that the ammonia and nitrites should be at 0 constantly, and the nitrates should be kept at under 20, respectively. Vampire Shrimp rarely breed in captivity, and if they do, it is even less common for their young to survive. However, if you are determined to try, you will need to first create the typical breeding environment for the Vampire Shrimp. At this point you will want them separate from other fish, since 1) the altered conditions may be less than ideal for them and 2) the baby shrimp may be at risk from fish and the like. Of course, to breed the Vampire Shrimp in the first place, you will need to find some females to pair with the males. You see, since the female Vampire Shrimp lacks the fins that the males have, they are considered less interesting to watch. Also, most people do not try to breed their Vampire Shrimp, and there is little need for the females otherwise. A couple of pointers? The water will need to be more saline and algae-rich coming breeding-time. Some opt to breed the Vampire Shrimp in an outdoor pond or the like. 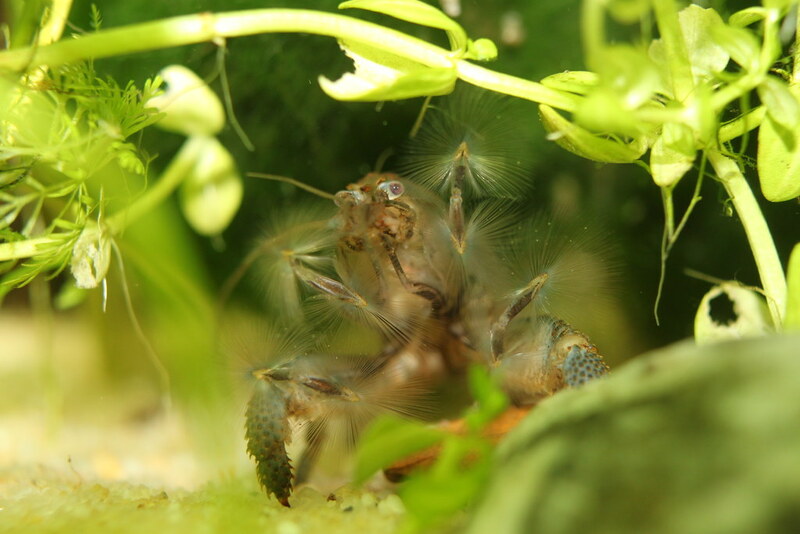 It is said that breeding the Vampire Shrimp can be similar to breeding the Amano Shrimp. This is worth a shot, certainly! Breeding the Vampire Shrimp is not impossible, after all; merely very tricky. The Vampire Shrimp is a fantastic little (“giant”) creature. Watching them move gracefully about in the dark under a glow-lamp can be surreal. It is also entertaining to watch them feed, and to try to catch a look at the retiring creatures when they peek out from their shelters during the day. They are so good-natured that they are fairly easy to pair with tank mates, making them ideal for most aquariums (refer to above). They are sure to add a splash of color and variety!